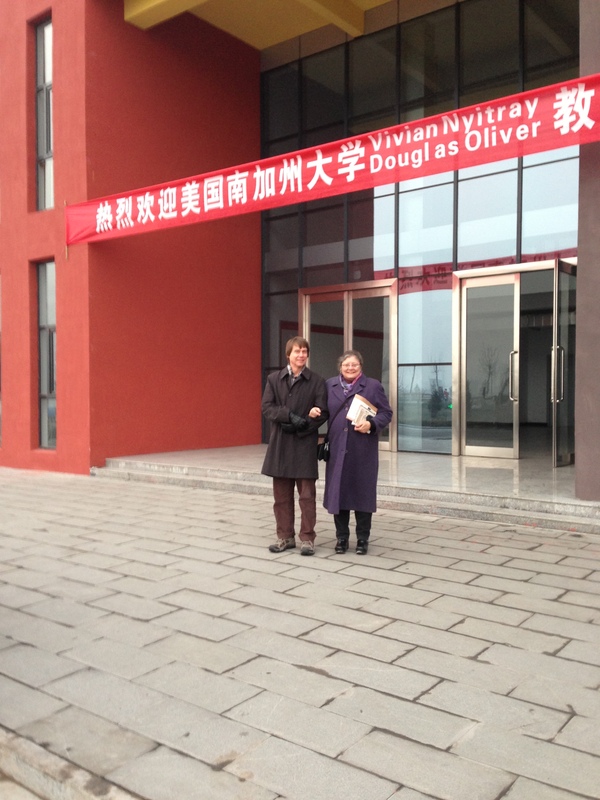 That week in December, our first week was spent up in Taigu 太古, Shanxi 山西 Province. We stayed at the best hotel in town and were driven to campus each morning after breakfast. That Taigu is small (by Chinese standards) and less developed was immediately apparent: our car sometimes needed to slow down to allow farmers to herd their goats ahead of us down the road. The hotel buffet breakfast was a simple line of dishes: steamed bok choi, steamed butternut squash, steamed mantou (a plain and rather tasteless white flour bun), soft boiled eggs, and xifan (congee with condiments). We gave the attendant our coupons and were handed a tin tray and a pair of chopsticks. Everything went on the tray and we found seats at the large tables, preferably away from the doors as there was no central heating. The first morning, we made the mistake of not taking our coats and hats with us and our teeth chattered as we ate hurriedly. Also on that first day, the staff apologized for not having any forks–an apology that was repeated at every Taigu restaurant we ate in that entire week. It was always a great relief to waitstaff to see that we had no trouble with chopsticks. On that first visit, we were given a warm welcome (although the banner over the front door incorrectly identified my then-current institution as the University of Southern California rather than the University of California, Riverside) and we were handed a full agenda for the week, after which we flew down to Chongqing for another week of meetings and observation. By the end of our two weeks (we declined the offer of the week at the villa), I could only ask, “Why wouldn’t I take this position?” Finding little to dissuade me once I was sure that Douglas would be happy with the move and once we’d thought through the finances and ramifications of leaving UC Riverside, I accepted Jason Peng’s offer a few weeks later. When we next returned to Taigu eight months later, we found that the hotel and all the restaurants in town–clearly hoping that we were the vanguard–had acquired forks and knives.